Sound sampling technology is not new — mega expensive studio systems have been in existence for quite a few years. They are used to capture real sounds, recorded conventionally, and convert them into digital form. Once a sound has been captured and converted into numbers, it can be stored in computer memory, manipulated and edited before being reconverted into an analogue signal for playback. All sorts of whizzo effects can be added during the editing stage, and the sounds engineered for bands such as Frankie Goes To Hollywood owe a lot to sound sampling techniques. Super sophisticated samplers, which included complicated software for editing sounds and creating effects can cost tens of thousands of pounds. Consequently, they are beyond the reach of most people’s pockets and are the preserve of professionals. 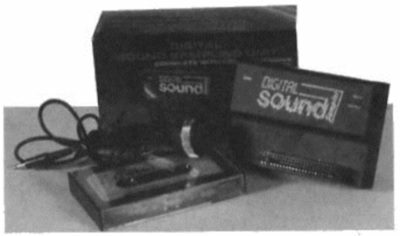 Datel’s sound sampler for the Spectrum is available for a little under £50 and comes complete with a cheapo microphone and a cassette of software to drive the hardware. Overall, it represents excellent value as an introduction to sampling sounds and fiddling around with them under computer control. The musician, the keen games programmer and the general interest user could all have a lot of fun with Datel’s product. The hardware is excellent, capable of very good quality sampling and reproduction if you ignore the dinky little microphone that it comes with. Either feed in sound via a good quality mike, or use your HiFi if you want to exploit the sampler’s full potential. For the home user, the fact that the hardware unit accepts mini-jacks (those used on the Spectrum’s cassette lead) is probably not too much of a pain. Anyone with the desire to do more serious work would probably want to install full size audio sockets on the unit, or at the very least buy a couple of converters. For under fifty quid, one can’t expect all the bells and whistles to be available, but the provision of knobs to adjust gain and feedback would have been a nice touch and shouldn’t have added significantly to the price. As it is you have to fiddle with the pots using a screwdriver. But enough of this preliminary carping! What can the Datel do? Well it’s all down to the software. Once you set up your cables and computer and are ready to feed sound in to and out of the unit, the next step is to load up the accompanying software and start experimenting. Four programs come on the cassette and the first provides an ideal starting point for some experimentation, providing a menu of options to choose from. You can record a sound into memory — sample it — and then play it back at varying pitches using the keys 1-9. Alternatively you can reverse the sound (play it from end to start) and then play it back over nine pitches. For amusement value there is a draw option, which displays a frequency plot of your sampled sound onto the screen. Amusement value, because you cannot then go on to edit it — but this ain’t a twenty five thousand pound Fairlight. Other menu options allow the sound to be played back with a rising pitch effect, echo, repeated playback and a chopped-off effect is created by a progressively faster repeat. Four different short sounds may be sampled and then played back using the 5, 6, 7 and 8 keys. Not quite Mr Copeland, but four finger drum solos are possible. All the effects work well, although there is a slight problem with the scaling — the playback keys provide a non-tempered scale which raises the pitch of successive notes by the same amount, which isn’t how the real musical scale works. A little annoying to the musical purist. The second program, keys, allows a sound recorded into memory to be played back using the top two rows of the Spectrum keyboard to emulate a one octave musical keyboard. You can hop up and down ten octaves, and while it is difficult to contrive to play a tune which spans several octaves, the pitch following was pleasingly accurate. A major deficiency was caused by a looping problem, however. If you press a ‘key’ down to sustain a note for longer than the sample length, then the note produced is not continuous. There’s a pause every time the end of the sampled sound is reached, while the software cycles back to the start again. The sequencer program allows tunes of up to 1,000 events to be programmed in step time, and edited as desired. Note time, pitch and octave are entered and then the whole tune can be played back using your sampled sound as the basis. In use, the sequencer was a pain to get to grips with — input was slow and a little tedious. Unless care is taken, the program has a habit of failing fatally. Fun, maybe for the masochist musician. Games Speak allows you to sample up to eight short sounds and then access them from within your own games program. Alternatively, you can store a meaty four second chunk of speech, for instance, which could be neatly incorporated into an adventure perhaps. Not yet of vast commercial potential, as not too many people own Datel Samplers at present, but some interesting speech systems could be written for it, which could be of benefit to the disabled. For fifty pounds Datel have produced a neat piece of hardware which, in the final analysis, is let down by the software it is supplied with. A little more thought on the echo facility software, for instance, could have provided a repeated echo which gradually fades in volume, or perhaps offered a chorus type effect which would have approached an automatic double tracking facility.